On October 20, 2018，Trump also stated that the United States will withdraw from the US-Soviet Treaty on the elimination of intermediate-range and shorter-range missiles signed with the Soviet Union 30 years ago. Since US President Donald Trump took office, the United States has become addicted to and has frequently withdrawn from a wide range of international organizations and multilateral and bilateral treaties. On October 20, 2018，Trump also stated that the United States will withdraw from the US-Soviet Treaty on the elimination of intermediate-range and shorter-range missiles signed with the Soviet Union 30 years ago. 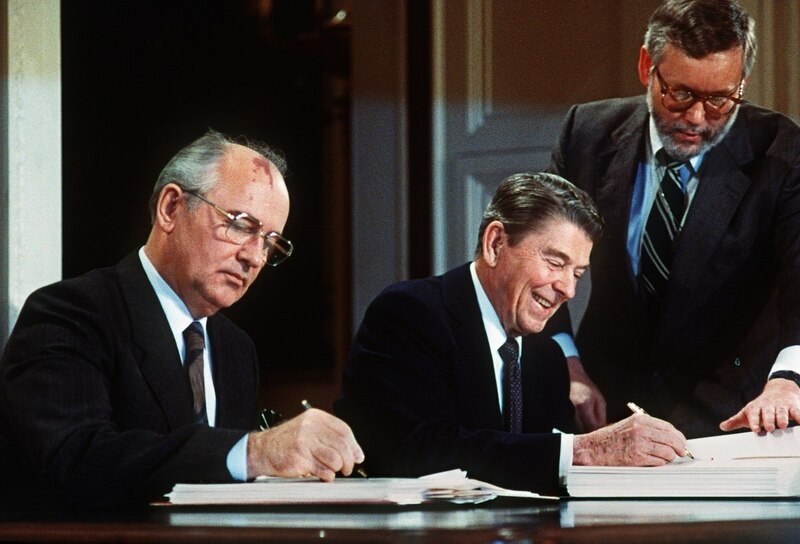 Δ In 1987, U.S. President Ronald Reagan and his Soviet counterpart Mikhail Gorbachev signed the INF Treaty. The US-Soviet Treaty on the elimination of intermediate-range and shorter-range missiles was to maintain strategic stability during the Cold War. In December 1987, the leaders of the two countries signed the treaty. The treaty stipulates that the two sides will no longer maintain, produce or test land-based cruise missiles and ballistic missiles with a range of 500-5,500 kilometers as nuclear weapon vehicles. At the beginning of October, 2018，US Permanent Representative to NATO Kay Bailey Hutchison issued a severe warning to Russia, saying that if Russia “violates the treaty again”, the United States can “take out” the missiles that violate the treaty. Her words were quite strong. The Trump administration’s decision to withdraw at this time will certainly have a huge impact on US-Russia relations. The Trump administration’s decision to withdraw from the treaty is not a rash move. Both domestic political factors and the demand for “great power competition” under the guidance of “America First” policy play a role, and the hardline faction within the Trump administration has actively contributed to this. 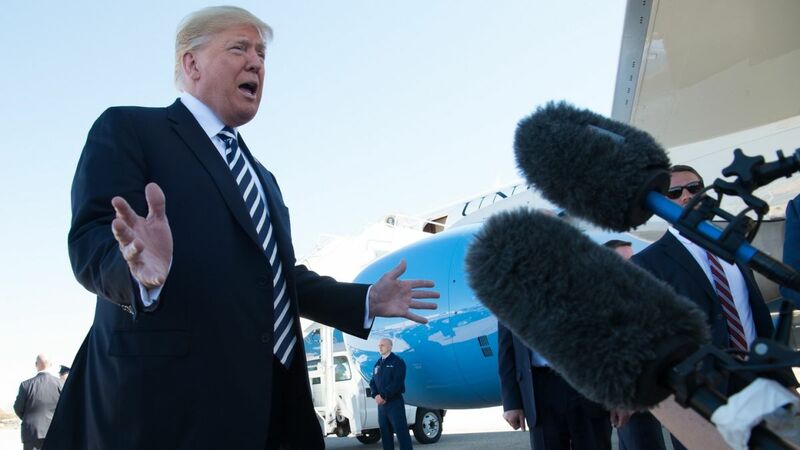 Δ US president Donald Trump has said he is going to terminate an arms control treaty known as the Intermediate-Range Nuclear Forces Treaty (INF) on Oct. 20th. From the perspective of domestic politics, the point in time that Trump chose to announce this decision falls just before American mid-term elections. Apparently, Trump must constantly cater to the conservative and hardline forces in his constituency base, especially since the claims of Russia’s involvement in the previous American presidential election continue to ferment, which leads to a high emotion of “anti-Russia” and “hate Russia” sentiment. In order to prove that he is not a president who colludes with Russia, Trump withdrew from the treaty without hesitation and showed a strong determination to the outside world in the attitude of practicing what he preached, intending to promote his domestic agenda and give GOP a lift in the mid-term election from the outside. From the perspective of great power competition, the Trump Administration thinks the treaty had become a “straightjacket” restricting the US from competing with Russia and China. On the one hand, the US believes that Russia has not faithfully performed its obligations as specified in the treaty. The US accused Russia of violating the treaty as early as 2014. Since then, the US has repeatedly criticized Russia for ignoring the treaty’s content and violating the treaty. 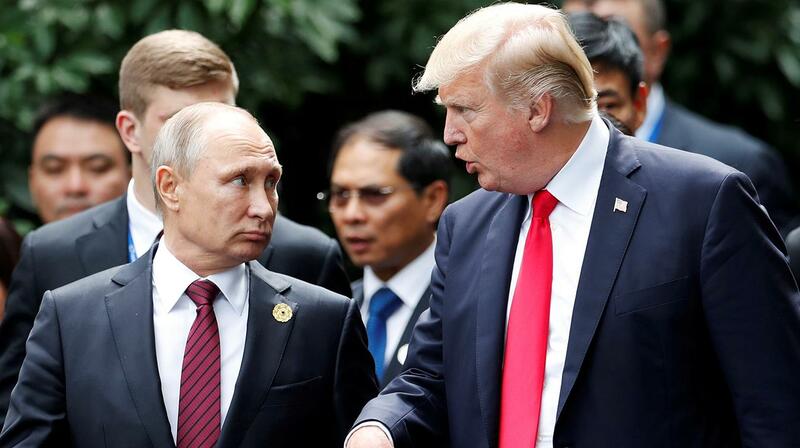 Some people within American strategic circles think that the treaty, which was signed during the Cold War, has been obsolete for years, and the US should choose to opt out without hesitation the moment Russia refuses to comply with the treaty’s content. On the other hand, the US considers this treaty to be one that exists only between the US and Russia, and the scope of its constraints are too narrow. Besides Russia, the Trump Administration also regards China as an important “strategic rival”. Some officials and scholars in the US think that due to restrictions within the treaty, the US is incapable of deploying new weapons to the Asia-Pacific region, which in turn causes the US to gradually lose its “military dominance” in the Asia-Pacific region. They firmly believe that withdrawing from the treaty will remove the heavy shackles holding back the United States. Thus, Trump Administration gives two options to the world: Either more countries talk with the United States an arms control treaty, or allow the United States to completely embrace its capability to launch military competition with rising countries in the Asia-Pacific region. In addition, withdrawal from the treaty also satisfies the demand of the White House hardliners on Russia. Within the White House, only Trump shows an attitude of “warmth” to Russia, finding himself surrounded by anti-Russia hardliners. Across US history, the ideal National Security Advisor should play the role of a “neutral mediator” within the White House. Such a role is to encourage other officials to speak freely and ensure that the president can hear more comprehensive information and opinions. However, John Bolton, the current holder of the post who hates multilateralism and arms control, has exceeded his authority and misinterpreted his job responsibilities. He has become a core adviser and a member of the foreign policy advisory team. He has not only promoted American diplomacy to continue to rush along a “regressionist” path, but also frequently appeared in public, even clamoring to prevent the US and Russia from extending the New Strategic Arms Reduction Treaty and refusing to restart Russia’s dialogue on strategic stability. Once the United States withdraws from the treaty, US-Russia relations will suffer in the short term. At a time when US-Russia relations are deadlocked and the strategic trust between the two countries is gone, the United States will once again destroy the areas in which the two countries can cooperate. The chances of the US and Russia slipping into “new Cold War confrontation” has increased sharply. Abandonment of the treaty will aggravate strategic mistrust between the United States and Russia. Since the end of last year, the White House has issued a number of official reports such as the National Security Strategy report and the National Defense Strategy report. It has clearly defined Russia as a strategic competitor and a challenge to its strategic positioning. The implementation of this kind of strategic distrust has come to represent tense confrontation in regional strategy. Regarding the European security, the most direct consequence of the US withdrawal from the treaty is to intensify the arms race in Europe and force the region to enter a new phase of deployment and counter-distribution of weapons. Judging from domestic factors, the US withdrawal from the treaty seems to have been a blow to “Russiagate” accusations directed at Trump, but the domestic constraints within the United States that have plagued relations between the two countries will not dissipate. Russian “intervention in the US general election” seems to have become a consensus among the two major political parties in the United States. The anti-Trump forces have long held such claims firmly in their hands, waiting for the opportunity to challenge the president’s ruling legitimacy. Should control of the House of Representatives be overturned by the Democratic Party in the mid-term elections, and if special prosecutor Robert Mueller’s investigation makes a substantial breakthrough, the process of impeaching President Trump may be launched. Such a scenario will render Trump even less leeway to promote the easing US-Russia tensions. Even worse, withdrawing from the treaty will directly squeeze the few areas of cooperation that currently exist between the United States and Russia. On the Syrian issue, in which the United States and Russia barely cooperated, local anti-terrorist tasks were generally completed and extraterritorial forces came to the fore. The big country game surfaced and US-Russia cooperation completely deteriorated. If this current arms treaty is abandoned, it would become even more difficult for the United States and Russia to continue on before the expiration of the New Strategic Arms Reduction Treaty in 2021. Therefore, although Trump has repeatedly stressed the need to improve relations with Russia, a wide range of constraints means Trump’s hands are tied. Trump’s withdrawal from the treaty is set to add salt to the wounds that exist from a long history of conflict between the United States and Russia. During Trump’s tenure, the prospects of turning US-Russian relations around have become increasingly slim.